I went to Zum Schneider tonight for the NYC debut of Schneider-Brooklyner Hopfen Weisse. Schneider-Brooklyner is a collaboration between Privatbrauerei G. Schneider & Sohn & Garrett Oliver of Brooklyn Brewery. When I arrived around 6:15, the place was packed! I lined up to get my Schneider-Brooklyner at the bar. The bartender was pouring the beer into large steins, letting it settle a bit, then pouring into glasses. It was a cloudy pour even after that – intriguing. 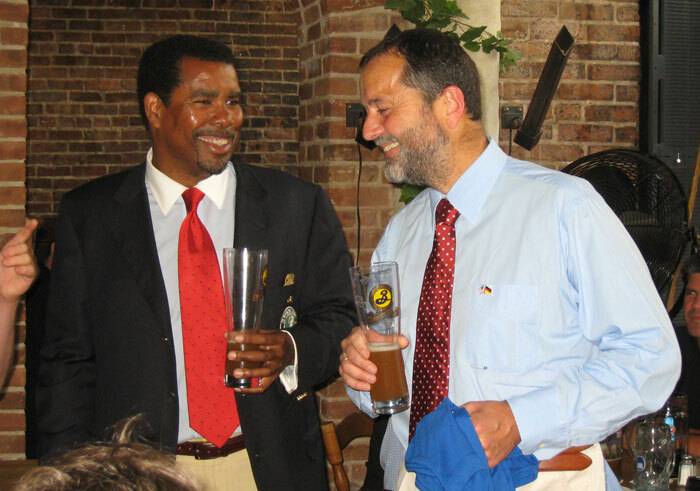 The glasses are beautiful – Weizen glasses with a lovely blue, yellow & gold insignia – very eye-catching. I found a seat with a friend and let the beer settle. Garrett grabbed everyone’s attention with the clinking of a glass and a speech was made. He thanked everyone for coming (it was a nice turn-out) and introduced Hans-Peter Drexler, his co-brewer of this special beer. The Schneider-Brooklyner is the first of two versions of the same beer, the first brewed in Germany as a pale weisbock. The remarkable thing about this beer is that it is dry-hopped with Hallertauer Saphir hops – 70 to 75 pounds per 25 barrels, or 3 pounds per barrel! “Outlandish”, Garrett said, for a German beer. Quite tasty, though, in my opinion(and that does explain the greenish cloudiness). The bottled beer should be spectacular! This Wednesday, Garrett and Hans will be brewing the second version of this beer at Brooklyn Brewery in Williamsburg. Hans has brought yeast over from Germany and will be selecting his favorite varieties of American hops to dry hop with. The beer will be available on draft in early August. 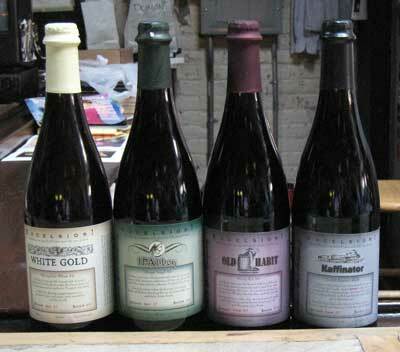 I’m looking forward to it and a vertical tasting will definitely be in order. Schneider-Brooklyner Hopfen Weisse is available on draft and in 16.9 oz. bottles (yeah, the bottle design is all that, too). It is 8.2% ABV and 40 IBUs. A very special beer and a fun evening! My friend Mike has more pics of the event at his Flicker site. 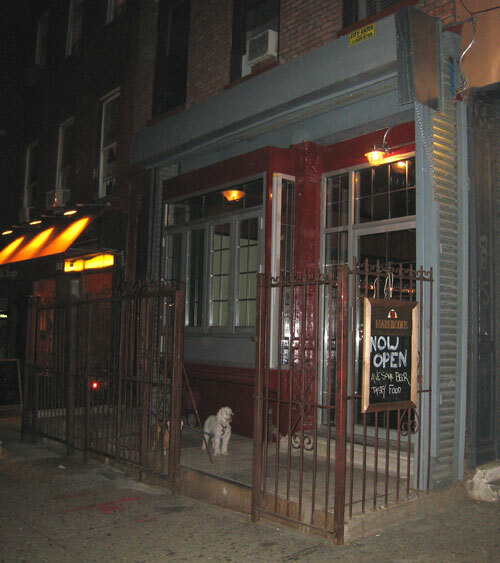 I also spoke with the owner of a soon-to-open craft beer bar in South Park Slope. 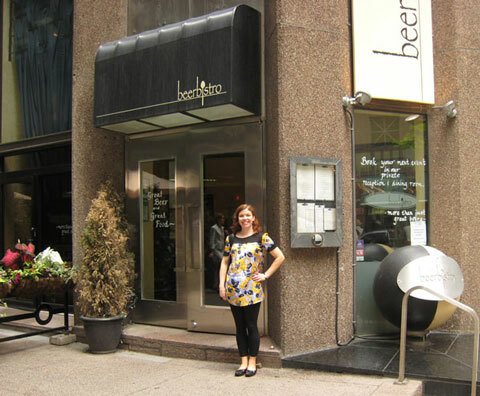 Beer Table will be opening on 7th Avenue between 14th & 15th St. There will be 3 drafts with a limited bottle selection that will change frequently. Housemade pickles and sausage will be available as well as cheeses. This is a very exciting development for this neighborhood (of which I am a resident)! Can’t wait to check it out. Wells Ales & Lagers is a new craft beer bar in Williamsburg. Owned by former industry rep Jeff Wells, it’s a charming place. 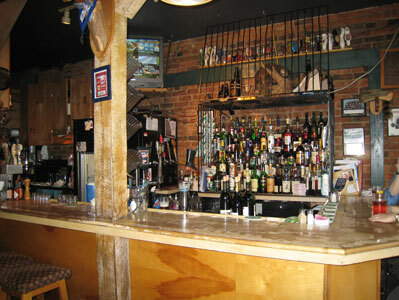 As you walk in, there is a long exposed brick wall on the right and the tile-backed bar on the left. Above the tile are two built-in shelves, the lower with appropriate glassware and the top displaying the many bottled beers they offer. 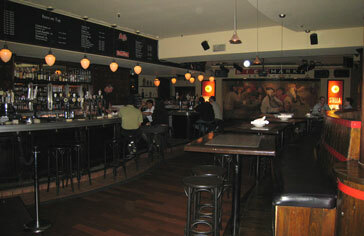 The bar is varnished wood with comfortable high chairs. A slatwood soffit and ceiling, recessed lighting, candles, fresh flowers, and a large, colorful painting all add to the ambience. Wells has a cozy yet sophisticated feel. 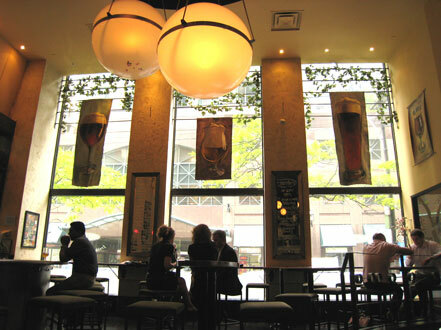 They offer 10 rotating drafts and over 100 bottled beers from around the world, a very well chosen selection. You can also purchase beer-to-go from a cooler in the back (prices are very reasonable). They serve food as well – paninis (mine was quite tasty) and salads, both made with local ingredients. A nice selection of cheeses is also available. The draft beers and food are listed on chalkboards along the top of the back wall and one clean unisex bathroom is located in the back, too. Wells Ales and Lagers is a very nice addition to the Williamsburg beer scene – I highly recommend you check it out for yourself. nearest subway: L to Bedford Ave, walk south on Bedford. The bar is just past South 1st Street on your left. So I read about a new restaurant serving Pacific Northwest beers not found anywhere else in NYC. But, of course, I could find no mention of what the actual beers were (big surprise, as beer is scarcely mentioned in your typical restaurant preview/review). Hmmmm….. I booked us a reservation on OpenTable to find out more. Wild Salmon is located on the NE corner of 3rd Ave & 40th St. We walked in and were immediately seated (thank you, OpenTable). 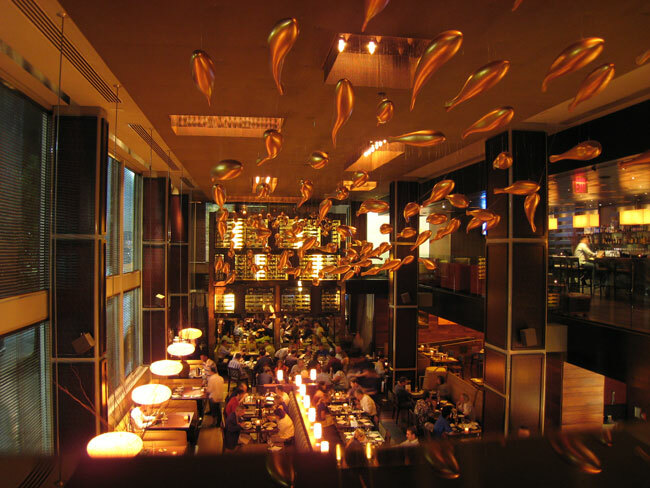 It’s a beautiful restaurant (Slander was entranced with the “stream” of metallic fish hanging from the ceiling). 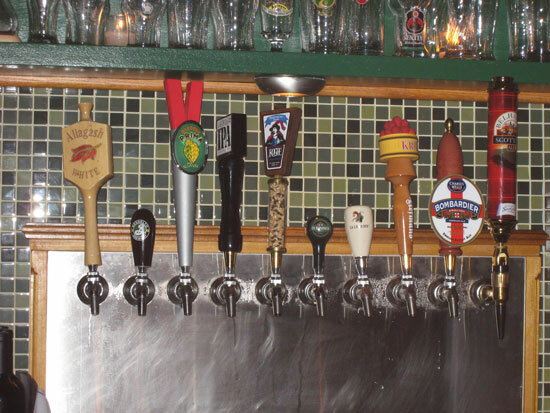 Oh – and the beers – 6 drafts: 4 from Pacific Rim Brewery, including Rat City IPA, Driftwood Ale, Vashon Old Stock Ale, and Admiral ESB; and 2 from Rogue, the Juniper and nitro Stout. They also have 9 bottles: 4 from Maritime Pacific Brewing Company, Nightwatch Ale, Islander Pale, Flagship Red Alt, and Imperial IPA; also Widmer Hef, Red Hook Copperhook Spring, Rogue Dead Guy, Stella, and Heineken. I’ve never had a Pacific Rim or a Maritime, so we were off to a good start. We tried several over the course of the meal, our faves being the Admiral ESB, Driftwood Ale, and the Nightwatch Ale. The meal was very good. They brought out freshly made flatbread sprinkled with herbs, yum. We shared a Pacific NW Nuts & Berries salad and the oven roasted alaskan sea scallops wrapped in lamb prosciutto, yeah, the latter was really good. I’m starting to drool just remembering. Slander had the Alaskan King crab legs (which went splendidly with the Nightwatch) for dinner, which he was quite happy with. I ordered the Coho Salmon, cedar planked, with wild oregon morel pinot noir sauce – very tasty. We finished with the goat cheese cake and the chocolate extravaganza. I love goat cheese cake and was very pleased with this one. We settled the bill and headed upstairs to check out the bar area. The grey marble bar seats eleven. Wood ceiling and floor with recessed upside-down candle lighting set off the red banquettes with black seat cushions and cheetah-print pillows placed throughout. There are also grey and brown leather chairs, milk chocolate brown crushed velvet chairs and crocodile-patterned ottomans scattered around. Tortoiseshell candleholders on the copper-topped tables add to the atmosphere. A plush, sensual feast with comfortable seating. A flat screen TV were playing the Yankees game. 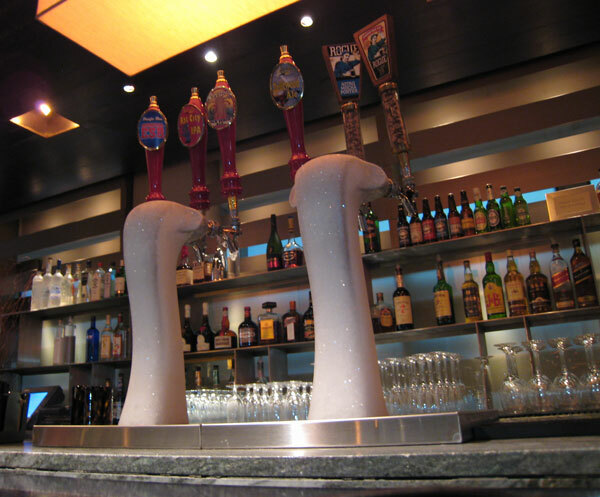 The taps are ice-covered – undoubtably serving the beer too cold, but very cool looking. 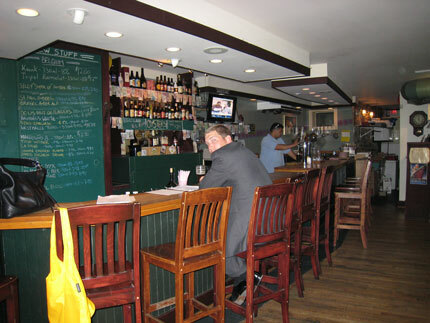 They have a nice bar menu, with snacks and more substantial fare. Draughts ran us $7 each, bottles $8 (entrees run between $23-$50, btw). Oh, and the upstairs bathrooms are a 5 out of 5 – clean, spacious, and aesthetically pleasing. My consensus: the restaurant is recommended to craft beer lovers looking for a special meal, or check out the bar for Pacific Rim and Driftwood beers in a beautiful setting (with tasty snacks as an option). 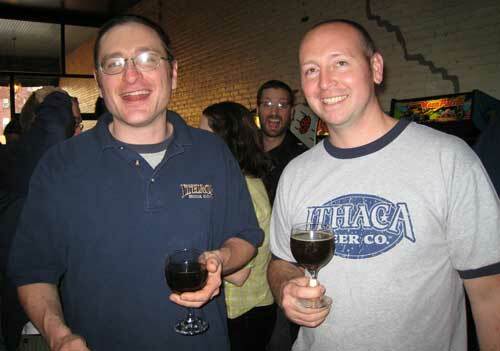 Ithaca Beer Company debuted several new Excelsior beers at Barcade on Thursday, June 7. I had the pleasure of meeting brewmaster Jeff O’Neill and seeing sales representative Eric VanZile again. I had the scrumptious Kaffinator, which was a very smooth, roasty, coffee-like beer. I tasted the Old Habit and the IPAbbey and am looking forward to having more soon. I highly recommend trying some for yourself. Be sure to check out Jeff’s blog for all the latest goings-on at Ithaca. My friend Allan had just returned from Montreal and brought a bottle of Bierre Nouvelle Sure Lie to share. I found it to be a crisp, spicy, fruity (pear, predominately), highly carbonated, dry beer. Very refreshing for a warm summer day. A nice evening. Worked the morning and headed to C’est What for lunch with 2 coworkers. Neglected to take a photo, but it is located in the basement of a building. Lots of brick, wood chairs, laid-back joint. They were out of their Homegrown Hemp Ale, unfortunately (well, I’ve never had a beer brewed with hemp) so I had the Great Lakes Orange Peel Ale. A drinkable ale, not overly interesting. C’est What has a diverse menu – my coworkers enjoyed the Moroccan Stew while I had the best poutine I have ever eaten. I hit the LCBO (Liquor Control Board of Ontario) near my hotel and picked some beers to take home (a 6-pack of McAuslan’s St Ambroise Oatmeal Stout and a couple of 650 ml bottles from Trafalgar, basically everything interesting they had). Out for a bit of non-beery shopping and then back to the hotel to meet up with coworkers for dinner. It was raining cats & dogs, which made it quite easy to convince everyone that we needed to go to the close-by Biermarkt for dinner and drinks. We sat at one of the large picnic tables in the back. Several of us ordered the Ale sampler: McAuslan Pale Ale, Affligem Blond, DeKonnick Amber, Delirium Tremens, Leffe Brune. There was also an Around the World sampler and a Belgian sampler. 8 oz samples of each, a bit ridiculous really. We shared some tasty appetizers and I had the mussels for dinner – not bad. 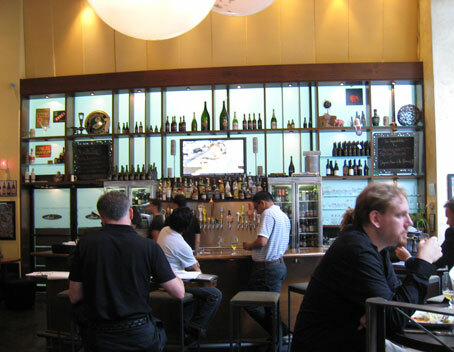 Biermarkt has 38 drafts and over 90 bottles & cans from around the world. It’s a large space with a stone & chrome bar. There are banquettes, tall tables & 3 large white paper-covered picnic tables in the bar area. Other table seating is located throughout the restaurant as well as outdoors. The lighting is low, candles are scattered throughout, large copper columns add interest and there’s a faux store-front, complete with etched glass windows with fabric awnings above on one wall. Hip kind of place, although not as focused on Canadian beers as many of the other bars I’ve visited. We wandered to the Irish bar next door, Fionn MacCools, apparently owned by the same owners as Biermarkt. And here was the score for the evening – bottles of Hoegaarden Grand Cru and Forbidden Fruit, unavailable in the NYC area (and I’ve been told anywhere in the US, although maybe that will be changing as the bartender told me it was a very recent addition to their beer menu). The Grand Cru was delish, with a sweet, honey, orange, spicy nose and a full mouthfeel, with more sweet honey, orange, and spiciness in the taste. The Forbidden Fruit was tasty as well. A perfect beer finish to a great little trip. Worked all day. 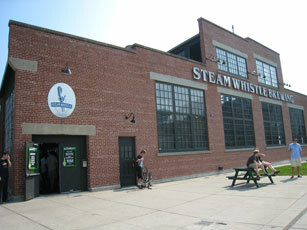 Upon exiting the convention center, I noticed a brick building with Steam Whistle Brewing in big letters. Brewing? Hmm, that’s not one of the ones on my list. Let’s go check it out. I dragged two coworkers along. We walked into the crowded doorway and were handed 2 tasting tickets. Walked up to the bar and were given 2 plastic cups of Steam Whistle, Canada’s Premium Pilsner. They went down easy enough – a smooth, refreshing pilsner, and were on our way back to the hotel to change for dinner (group dinner: excellent steak, but alas, no decent beer). After dinner, I headed to the distillery district and Mill Street Brewpub. There was a line to get a table, but plenty of seats at the bar. The bartender gave me a small sample of their kriek in a small plastic cup as I sat down. They don’t have a sampler, but the bartender was generous with the samples after I asked (in glass, instead of plastic). I had 11 drafts and 1 cask. I’ll highlight some of my favorites: the Tankhouse Ale was light amber and clear, with a floral, orange blossom, citrus aroma and the same flavor and a nice biscuity maltiness to back it up. The Coffee Porter was a dark brown, with a huge tight tan head, roasted coffee predominating in the nose, excellent roasted coffee tones, bittering slightly at the end, with a sweet maltiness underlying and rounding out the flavor profile. I found the Mill Street Pilsner to have a clean, grainy sweet aroma, same in the flavor with a bit of hop spice, a well-balanced pilsner. The ESB had biscuity maltiness in the aroma, with some herbal hoppiness as well. It was light-bodied, with a nice biscuity maltiness, bittering nicely at the end, quite balanced, with some clean sweetness. Their lightest offering is the Original Organic Lager, which I think is very cool – at least the light beer crowd is drinking organic at Mill Street. 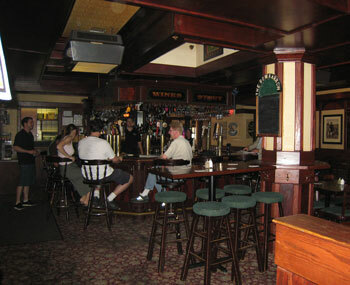 The wood bar at Mill St seats about 13, set in a large lofty brick space. 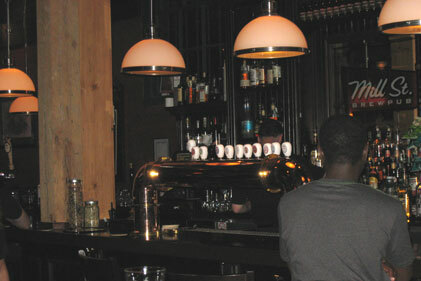 The brewing equipment is in a glassed-off area in the middle of the room, hockey was playing on the 2 flat screens in the bar area, with several more flat screens scattered throughout the restaurant. Pop music from the 60s to now was playing, and the lighting is diverse and relaxed. There’s also a retail store where you can buy beer and schwag. A comfortable place. And the Distillery District is very cool – lots of shops, galleries, restaurants, etc in a historic and interesting location. nearest station: Union, walk west on Front St, south on York, west on Bremner. You’ll see the Roundhouse at the end of the park. Directions to the Distillery District can be found on their website. I’m in Toronto for work, flew in early to take in the beer scene. Toronto is only an hour flight from LaGuardia airport – easy! 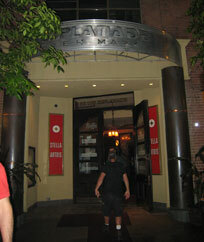 Landed around noon, checked into the hotel and my coworker Jeff and I walked up to beerbistro. I ordered a sampler, 3 100 ml beers for $6. I started with the St Ambroise Oatmeal Stout from McAuslan Brewery, which had a large creamy head and was an opaque black/brown color. The aroma was slightly sour, sweet and milk chocolate-y. It tasted creamy smooth, silky, with milk & dark chocolate flavors, a bit of tanginess midway, bittering out at the end, and very lightly fruity – delicious! Next up was King Brewery Dark Lager. This was dark brown, opaque, with a low/medium head. Aroma was sweet molasses and toast and the taste was as well – a very clean, malty lager. Last was Scotch Irish Major’s IPA, a bright gold clear pour with a white moussy head. A floral fresh fruit hoppiness in the nose and it tasted biscuity, with a herbal/floral hop character, bittering nicely but not overwhelmingly medium way through. Three tasty beers – my Toronto beer experience is off to a good start. Jeff and I split a bottle of Church-Key Brewing Holy Smoke next. This beer was very cold, a clear, dark brown, with sweet, peaty characteristics. We found it highly carbonated – I unfortunately found it tasted like more like a smoked soda pop as it warmed up. Just not enough malt and body to balance the smoke for me. Oh, and the food – I had the Brussels Mussels (served with Cantillon sourdough bread) – quite tasty. Jeff had the smoked trout salad which he said was both savory and filling. We sopped up the mussel broth with the bread until there was no more – delish. The beerbistro has an urban w/homey touches (loved the silk hop vine draped around the top of the banquettes and windows) feel. High ceilings, a 7-seat curved bar with high tables in front and 4 super comfortable banquettes to the side. The large beer banners in the windows and beer posters on the walls are a nice touch. They have 20 taps and around 90-100 bottles from around the world. The beer menu is broken down into different categories: quenching, crisp, appetizing, sociable, satisfying, bold, fruity, robust, spicy, soothing, contemplative, smoky. Each item on the food menu recommends a pairing category. This is great for easy pairing, but a bit confusing if you want to browse a certain style (like porter) or are looking for a particular beer. Lovely place – highly recommended. Jeff and I split up at this point, as he had friends to meet and I had a museum to visit and a pub crawl to do. I bought a day pass for the subway – $8.50 each. The subway is very clean and easy to maneuver – the perfect way to get around town. I took the subway to the Textile Museum of Canada (which was fabulous but completely unrelated to beer). After that, I walked to Smokeless Joe. They had 6 drafts: Durham Hop Addict, Durham ESB, Durham Blak Katt Stout, KLB Raspberry Wheat, Cameron’s Lager, and Konig Ludwig Weisse. I chose the Blak Katt Stout. Opaque black w/large creamy tan head, served too cold for an aroma unfortunately. Very creamy in mouthfeel – easy to drink – light roastiness, some bittering towards end, pretty smooth. Smokeless is a narrow space, with a wood bar seating 10 or so. There are additional small tables/counters at front and back of the room. Brick walls on the right and back and green chalkboards on the walls display drafts, new beers, specials. There’s an outdoor seating area in the front. The have at least 120 beers on the bottle list from around the world. They serve half pints and pints – no sampler. I didn’t eat here, but the menu has soups, salads, sandwiches, and mussels. 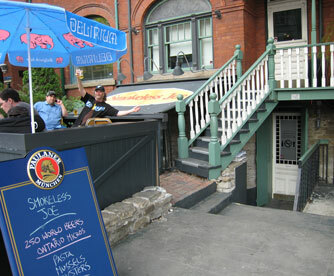 A definite must on any Toronto pub crawl. Back to the subway and off to Bow & Arrow. 24 taps and up to 3 casks, all Canadian. Ordered a half-pint of the Black Oak Pale. Clear, bright gold with a low head, nice fresh floral/fruity nose, highly carbonated (spritzy), very lightly bitter English-style pale. Lightly fruity and refreshing. 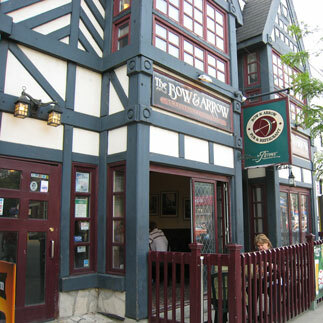 The Bow & Arrow had a very English pub kind-of-feel – 10-seat U-shaped bar topped with green marble-looking stone, lots of wood tables, green padded stools, chairs and banquettes. There’s a floral-patterned carpet and wallpapered walls with lots of wood accents, etched mirrors – cozy place. There’s also a back deck, full food menu, multiple dining rooms, quite family friendly. Oddly, only 4 or 5 bottles of mainstream macros. 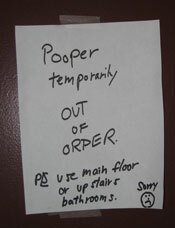 I was greatly amused by this sign in the women’s bathroom on my way out. Yep, back on the subway and onto The Rebel House. 17 drafts, mostly Ontario locals. I had a half-pint of the Neudstadt 10W30, which was a dark amber/copper, very low head, malty aroma, too cold past that. Nice malty flavor – dark caramel, dried fruitiness, nicely balanced, not too sweet, tasty. 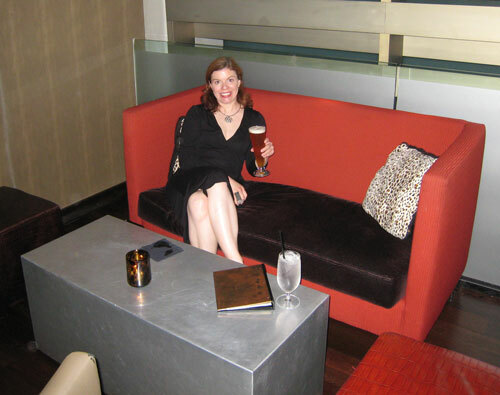 I sat at the slightly worn wood bar in a padded seat (of which there are 9). The big windows in front and back booths make this a very comfortable place. There’s a very popular backyard deck (with an hourlong wait when I was there) and a second bar and more seating upstairs. My last stop of the night was Volo. I unfortunately neglected to take a photo, but it is a fantastic place. Bistro atmosphere, old-fashioned light (Victorianish) light fixtures, tin ceilings over the bar area, tile floor, with wood in the bar area, and padded stools and a couch in the bar area. Tables inside and sidewalk seating as well. There were beer and brewing magazines and books in the bar area to browse while you are partaking. 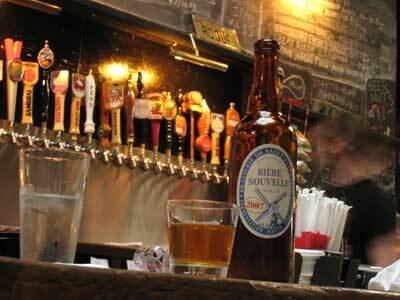 11 drafts and a huge bottle menu from around-the-world. And they offer a sampler – perfect. I had the Best Bitter Maple Porter, medium brown, clear, low head. Strong maple aroma and flavor. Sweet but not too much so – really quite nice. I also had the Church-Key Catch Her Rye, which, to be quite honest, I found peculiar. It had a very odd smell – definitely some type of herb or vegetable and it was very spicy in flavor, but more like a pepperoni pizza due to the lack of sweetness. Well, it was a bit sweet, but overall I found it quite odd – definitely worth the taste, but not for me. I then had the County Durham Hop Addict, an American-style IPA. A clear gold, with a nice hoppy aroma – citrus primarily. Nice citrus flavor, bitters midway to the end, remains on the palette, with enough malt to back it up, but definitely leaning towards the hop side. I met two fellow beer geeks at this point who introduced me to the delightful owners, Ralph and Ina. I snacked on an Ontario cheese plate and split a few bottles with the guys. I had the Yukon Midnight Sun Espresso Stout, the Black Oak Double Chocolate Cherry Stout, and the Scotch Irish Tsarina Katarina Imperial Stout. I wasn’t taking good notes at this point in the evening, but I assure you that I enjoyed all three and the company as well. Volo was the perfect end to my Toronto pub crawl.